Does anyone have any PMs working part-time? Are they doing a full PF? Hi @sarah I work with a few offices that do this and in my younger years, I job shared with another Mum who had children of a similar age. It worked incredibly well, we both had a similar style and couldn’t bear the thought of the other person having to pick up our slack. The boss always said he got 6 days out of us, rather than 5. It is really important to get the “right” person in the role. They may just need to pick their kids up from school and are happy to log on and make phone calls from home once they have fed their hungry munchkins. It is probably more important that they are willing to take phone calls during this time, rather than be willing to make them. I once had a lady who worked for me that needed to leave the office at 2.50pm every day to collect her kids. She was ready to go at 2.49pm - I could not ask her to work later than that but while she was in the office, she was 100% focused. Her role was very admin based so clients were not expecting to speak with her directly. You need to have very clear guidelines around how this will work so as not to upset the team dynamic. I have come across another situation where a PM starts early so she can finish early. Unfortunately, the rest of the team is left to deal with any issues that arise, particularly when she doesn’t answer her phone. Whilst she is quite efficient with her inspections, maintenance, etc, she is not available when owners and tenants need her. They would be better off having her work within a Squad Structure so that there is the continuity of service to the client. @ashley.giles has a Property Manager work part-time/from home and she manages a portfolio very well. He might have some advice for you around his structure. We do have a part time PM, she was a former full time who came back part time after children. She runs a small portfolio from home, (office one day a week for meetings / viewings etc) she runs 40 properties, we do her letting viewings however. It works really well, she is in for meetings, still participates in Slack and is still one of our top performers. We would not consider this for everyone, it works because she was already part of the culture, and her husband Barnabas is with us full time also so its a great cross over. We have had part timers in the early days of our business ( as we did not have full portfolios to hire for) it did not end as well. We also have 2 other part time roles, one for letting (filling in Thurs and Friday when our letting agent is off so we have 7 days of viewings) and a part time admin who works school hours. Both work very well but are managed by a buddy system. Happy to have a zoom catch up if you want to ask more, or if I can help at all. Quick side note, we have quite a few people with serious commutes (over an hour and half each way) we offer them flexi time where they work from home one day a week, and can miss traffic via their laptops etc. 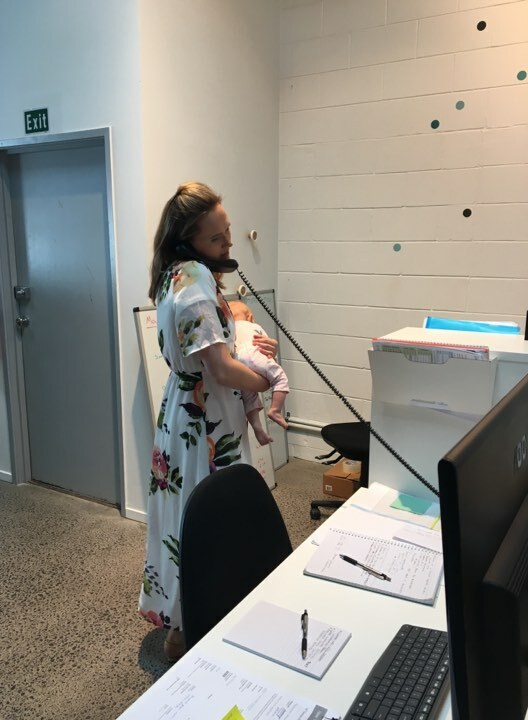 Another one of our part timers bringing baby into the office, my wife Nat having no problem working and steeling baby cuddles! It may not work for every business, but ours is a family, and family makes it work.